More Gain, Less Pain, with Shaklee Physique® Natural Recovery Shake. Work out harder. Recover faster. Repeat. Shaklee Physique® Natural Recovery Shake is a pure, natural, high-octane fuel for rapid muscle recovery, endurance, and strength. After Exercise: Shaklee Physique® Pure Recovery Shake is a scientific blend of protein and carbohydrates proven to improve glycogen synthesis and stimulate muscle recovery after a workout. What makes the Shaklee Physique® Pure Recovery Shake such an effective and valuable after-workout, muscle recovery product? One of the best of many post workout supplements, Shaklee Physique® Natural Recovery Shake has been clinically tested and proven to accelerate muscle recovery after exercise, Physique with BIO-BUILD® has been clinically proven to naturally activate the body’s recovery process and is one of the best build-physique products available. Plus, the intelligent-release protein blend allows your body to absorb a full spectrum of amino acids over time to help re-energize depleted muscles. 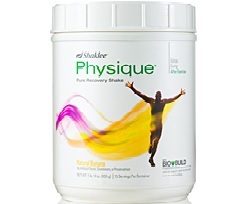 Shaklee Physique® Natural Recovery Shake improves muscle recovery. Its specifically designed nutrition for muscle recovery helps you recover more completely post workout. Physique restores energy to your muscles when taken immediately after working out and again two hours later. Allow your body to absorb a full spectrum of amino acids over time. Help build firm, lean muscles. Help restore muscle energy rapidly. Support post workout muscle repair. Shaklee Physique® Natural Recovery Shake has just the right amount of protein and carbohydrates to help you recover faster and optimize muscle rebuilding, and, at the same time, it contains no artificial flavors, sweeteners or added preservatives. If you need more information about build physique products you will find a very informative website at Natural-Health.MyShaklee.com.